The Gran Telescopio Canarias (GTC) started its operational phase with its first scientific observations on March 16th, 2009. Gradually, as the telescope and the instrumentation suit develop, more time is being dedicated to scientific activities. During Semester 2019B about 80% of the time will be dedicated to science observations. 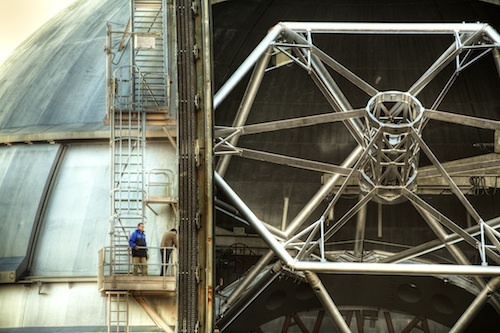 The remaining time is primarily being dedicated to extending and improving the functionality of the telescope and the commissioning of new instrumentation and observing modes. Potential applicants for observing time are referred to the formal Announcement of Opportunity for each observing semester that will be posted on the GTC web pages and where details can be found on the instruments and observing modes that are offered. Observations are being carried out either in queue-scheduled service mode, or in classical observing mode with the observations scheduled on specific nights. Applicants who wish to carry out the observations themselves according to a fixed time table should indicate this on the application form by selecting the "classical" observing mode option. The observatory will take this into account when drawing up the observing schedule, but no guarantee can be given beforehand that the request can be honored. In particular programs of low priority will likely be carried out in queue scheduled mode. For those PIs who will come to observe at GTC we present the following practical information in english and spanish. We urge visitors to carefully read these instructions. During Semester S19B the telescope will host up to six instruments: OSIRIS, MEGARA, EMIR, HiPERCAM, Canaricam and HORuS. OSIRIS is permanently installed in the telescope´s Nasmyth-B focal station and offers the following observing modes: broadband imaging, narrowband imaging with either Tunable Filters or the scanning Fabry-Perot NEFER, long-slit and multi-object spectroscopy (MOS) in the optical wavelength range, and frame-transfer readout modes and fast-photometry modes. Frame-transfer and fast-photometry readout modes will only be available for observations in classical visitor mode, in the presence of the PI. Also for MOS observations a number of restrictions apply: MOS observations require significant preparations by the science team as well as by the observatory. These preparations require time and therefore lead to certain scheduling restrictions. OSIRIS MOS observations are only admitted for programs that fall in the top of the TACs ranked list (A or B band proposals). Furthermore, to design and manufacture MOS masks the science team must have available either accurate equatorial coordinates for all their science targets as well as for the alignment stars, or they must have access to an OSIRIS Sloan r´ band image that can be used to design a mask. In case an OSIRIS pre-image must be obtained, no guarantee can be given that the full cycle of obtaining a pre-image, mask design, mask manufacturing and preparation, and observation can be completed within one semester. Hence when requesting MOS observations in classical visitor mode, the science team must already have an adequate OSIRIS Sloan r´ image of their field available before the start of the semester. If not, the observations cannot be scheduled. Alternatively, OSIRIS MOS observations can be scheduled in queue mode. But as before, in case the science team requires pre-images of the MOS fields as part of the program, it is required that the program is given an execution period beyond one semester by the Time Allocation Committees (i.e. the ones ranked as A-band proposals), otherwise the observation cannot be accommodated. More details on the observing modes for OSIRIS can be found here. When preparing observing proposals it is important to make realistic estimates of the observing overheads at the time of writing a proposal. As a guideline, for simple observations in both imaging and spectroscopy mode a total overhead of 10 minutes per Observing Block should be accounted for, and for tunable filter imaging to 20 minutes. Note that these numbers serve as a guide only and may vary accordin g to the detailed definition of the OB (for example, they don't include the time for acquisition and throughslit images, if required, as they depend on the exposure time needed) (details can be found in the Phase-2 manual). Observing overheads with the tunable filters are large due to the complexity of the observing process and the necessity to regularly re-calibrate the filter. These overheads, to first approximation, have been included in the Phase-2 definition tool. When using the tunable filter, for reasons of overall efficiency and since these calibrations are specific for each observing program, we require that applicants define their night-time tunable-filter calibrations also as Observing Blocks. The time necessary for these calibrations will be charged to the observing program. During the observing night the observatory will carry out a series of standard calibrations that for OSIRIS include bias frames, flat fields, spectral lamp exposures, and (spectro-) photometric standard stars. This will be done to the best of our ability, taking into account the science programs that are scheduled during the night, the weather conditions and possible problems with the equipment that may occur. Since these standard calibrations will not be specific to any one science program the time required for this will not be charged to any program but taken from the general observing overheads. An exception to this philosophy are OSIRIS tunable filter observations for which, as explained above, calibrations will have to be explicitly specified and charged to each program. Given the wide range of combinations of the instrument setup, the standard calibrations are restricted to 2x2 binning of the CCD, unwindowed readout of the CCD, and only for a readout speed of 200 kHz. (Note that from semester 2013B onwards the standard readout mode will be 200 kHz for all OSIRIS observing modes). For more technical details see the OSIRIS instrument page. Observing programs that require a different setup will have to define their calibrations as observing blocks (or in the README file, where appropriate) for which the time used at night (e.g. for observing standard stars) will be charged to that program. For semester 2019B the instrument will be made available for imaging, longslit spectroscopy, and multi-object spectroscopy. For observing overheads when using EMIR we refer to the following section of the description of the instrument: EMIR observing strategy and Phase 2 and the Phase-2 manual. As a rough estimate, for typical deep exposures in imaging mode, open-shutter efficiency can be of the order of 70% (including dithering, readout overheads, etc. ), while in spectroscopy this efficiency can be as large as 90%. During the EMIR operation the user should select the appropriate telluric standard and prepare the corresponding observing block, so the time at night will be charged to the program. As in any other NIR instrument, sky background variations dictate the use of dithering in all the scientific observations. EMIR manages this in a direct way by only defining the total on-source time required. The system internally will divide this in an optimal combination of a series of different exposures by taking into account the coherence time variation in the desidered filter/grism. For more technical details please read the EMIR user manual and the Phase-2 manual. For semester 2019A the instrument will be made available with all its capabilities, both integral-field Unit (IFU) and multi-object spectroscopy (MOS) modes. Further information about the instrument can be found in the MEGARA web page. The HiPERCAM high-speed, multi-band optical imager is a GTC visitor instrument (P.I. Vik Dhillon) located in the Folded-Cass E focus. HiPERCAM is able to image simultaneously in 5 channels (u', g', r', i', z') and to frame at (windowed) rates of well over 1 kHz in a FOV of 2.8 x 1.4 arcmin with a 0.081 arcsec/pix plate scale. HiPERCAM was received at the telescope on January 2018 and is offered during semester S19B on a "shared risk" basis with the observations to be executed on September-October 2019. Further information about the instrument can be found in the HiPERCAM web page. For semester 2019B the instrument is offered on a "shared risk basis" for imaging and low-resolution spectroscopy in the 10 and 20 microns bands, as well as for imaging and spectral polarimetric observations, with the observations to be executed on October-December 2019. For observing overheads when using CanariCam we refer to the following section of the description of the instrument: CanariCam Overheads and the Phase-2 manual. In the case of CanariCam, calibrations will have to be requested and defined by the PI of each proposal since due to variable atmospheric conditions calibrations can normally not be shared between observing programs. Hence each PI can define the optimal sequence of calibration measurements for which the time will be charged to the observing program. It is therefore important to take this into account at the time of writing the observing proposal. The observatory will obtain photometric measurements to gauge the atmospheric content of precipitable water vapor as a general service to all programs. Mid-IR observations, in particular in the 20-micron band, are affected strongly by the level of precipitable water vapor (PWV) in the atmosphere. In order to maximize the success of your observing proposal an adequate limit should be requested. We advise not to overstate this requirement as this will hamper the execution of your program in the observing queue. From semester 2013B onwards a generic maximum precipitable water vapor limit of 15 mm for any observation carried out in the N-band will be applied. The effect of water vapor in this band is rather limited, while placing an upper limit on PWV seriously hampers the possibility to execute observations, especially during the summer period. Therefore, in order to be able to exploit CanariCam for more time, all observations in the N-band will be carried out without limitations on PWV up to a measured PWV of 15 mm. For observations in the Q-band no such limit will apply since the impact of PWV in this band is much more severe. In case of mixed N-band and Q-band observations within a single observing block, the most stringent PWV condition accepted will also be 15 mm. It is therefore strongly advised to define Q-band and N-band observations in separate observing blocks. The Observatory believes that this measure strikes a better balance and will allow exploitation of CanariCam more fully and thus complete more observing programs. The High Optical Resolution Ultra-stable Spectrograph (HORuS) is a new GTC visitor instrument (P.I. Carlos Allende Prieto). This is a high-resolution spectrograph with FWHM resolving power of about 25,000. It collects light at the Nasmyth focal plane, shared with OSIRIS, using a 3x3 IFU (2.3x2.3 arcsec) with microlenses, providing almost continuous coverage between 380 and 690 nm. HORuS completed its commissioning at the telescope on December 2018 and is offered during semester S19B with the observations to be executed from July 2019 onwards, to extend the availability of the instrument as much as possible before the migration of OSIRIS (currently planned for March 2020). Further information about the instrument can be found in the HORuS web page. Observing time on GTC is shared by different groups. Fixed fractions of time are available for the Spanish community, University of Florida and Mexico. In addition there exists the possibility to apply for collaborative time under agreements between Spain and Mexico. Finally, GTC participates in the CCI International Time Programs (ITP). Approximately 6 months before the start of each semester an Announcement of Opportunity is issued by the observatory where specific details may be found on for instance the instruments and observing modes offered. ITP time is announced separately, once per year. For ITP proposals different rules and limitations apply; for details we refer to the ITP Announcement of Opportunity. All regular observing proposals are processed through the on-line application system hosted at the Instituto de Astrofísica de Canarias (IAC): CAT. This is referred to as Phase-1 of the proposal handling procedure. It is important that applicants apply to the appropriate time fraction (Spanish CAT, Florida, Mexico, or the collaborative Spain-Mexico time). For Semester 2019B, no Large Programmes are offered at GTC. From September 2014, there is Director's Discretionary Time available at the GTC (GTC-DDT). Details on how to proceed with this kind of proposals can be found in the Spanish CAT web pages. The historic balance of use of observing time can be seen in the adjacent graph, showing the actual use of observing time for each class of time allocation. Observing semesters at the GTC are as follows: the A-semester runs from March through to August, while the B-semester runs from September until February the following year. Regular proposals normally remain active during one semester only. However, the Time Allocation Committee may decide to extend the duration of proposals. CCI-International Time Programs (ITP) normally cover a one-year period, starting in the B-semester and running through the following A-semester. 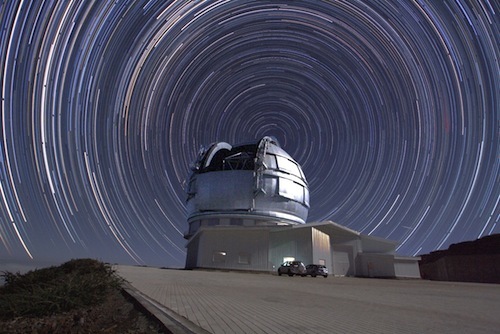 Observing time is made available to astronomers from institutes in Spain, Mexico and University of Florida. Besides these three partners, once per year opportunities are opened for CCI International Time Programs (ITP). Since semester 2015B Spain offers observing time for GTC Large Programmes (GTC-LP). For all these regular observing opportunities a call for proposals is issued to which eligible astronomers must respond in order to be considered for observing time. Proposals are first assessed and ranked on their scientific merit by the respective Time Allocation Committees (TACs). Following that, a technical assessment takes place by GRANTECAN personnel. The TACs decide on which proposals will enter the observing schedule. Execution of the observations in the queue is primarily carried out in order of scientific priority, as decided by the TACs. Apart from the scientific priority, also the required observing conditions play an important role in the correct planning of the observations. In queue-scheduled observing mode the observatory will attempt to match the required observing conditions to the actual observing conditions on-the-night. This method of dynamic scheduling implies that normally observations are not given a fixed observing slot. This allows for a higher chance of success for the most highly ranked proposals, and it allows the best possible exploitation of the prevailing observing conditions. A-band proposals have very high priority and all possible efforts will be made to execute all of the required/approved observations in the requested semester. If for any reason, A-band proposals remain unfinished by the end of the corresponding semester, the existing GTC Phase 2 will be granted an extended life-time of two additional semesters, or until their completion, whichever comes first. Unfinished A-band proposals do not have to be re-submitted in the following two semesters because of their carry-over status. B-band proposals will be executed on a best-effort basis during the requested semester, and do not have a carry-over status. Approximately three quarters (according to the TACs ranking) of the total amount of GTC available observing time falls in this band. C-band proposals will be executed in extraordinary cases when no A- or B-band objects are available but the good weather conditions permit observations during the requested semester. C-band proposals do have very little opportunity of execution until completion of the project, yet they are included in the GTC observing queue. It should be noted that the total queue is over-subscribed, which will affect proposals in C-band. D-band proposals (or fillers) require very relaxed observing conditions and cover a wide range of coordinates so that they can therefore be carried out essentially any time during the semester. Observations in this band will only be executed if the observing conditions do not permit observations of proposals in A-, B-, or C-bands. The scientific ranking will of course be a decisive factor in the final scheduling also for these proposals. As a secondary consideration GTC will give priority to completing observing programs in order to maximize the scientific return. Given this method of scheduling observations, potential users of the telescope are advised not to overstate their requirements on the observing conditions as this will generally increase the pressure on the most favorable conditions and hence reduce the chance of successful completion. Also, the final execution success of an specific program is strongly related with the visibility distribution of targets along the semester. Objects that lie in an overpopulated range of coordinates would decrease their chance of execution unless they were classified as a top ranked proposal. 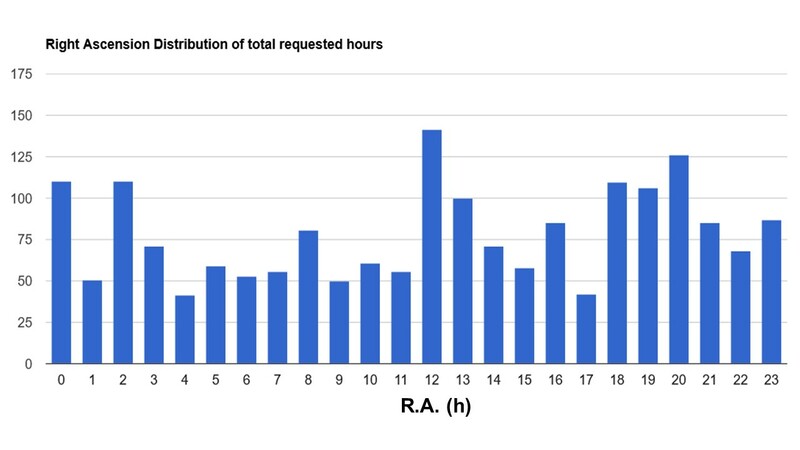 Following graph shows the R.A. distribution in the current observing semester at GTC (Semester 2019A). Observations may also be executed in classical observing mode. This implies that the observations are scheduled on specific nights and are executed in the (local or remote) presence of the applicant and her/his team. If for whatever reason (weather of technical) the observations cannot be carried out, then the opportunity is lost. If you would prefer to carry out your observations in visitor mode but cannot be present on the night scheduled for your observations then the GRANTECAN astronomer can carry out the observations for you in service mode. Or alternatively, on the observing night remote contact through eves dropping during the observations is also an option. In this way the PI can remotely assess the data quality and adjust the observing program without the need to be physically present in the control room. The PI should contact her/his support astronomer well ahead of time if she/he will direct the observations remotely. Interested prospective applicants should request "classical" observing on their application form. Once granted time by the TAC, the PI will be informed as to whether the observations will indeed be carried out in classical visitors mode, and on which dates, or in queue-scheduled mode. We note that only programs in the top of the TACs priority list (A or B bands) can enter as visiting observer programs . Programs of lower priority (C band) that requested visitor mode will automatically be scheduled in the observing queue with their corresponding priority. All regular observing proposals have a life span of one semester. However, the Time Allocation Committee may decide to extend the duration of the observing window over more semesters. An overview of the time allocations can be found through this link by selecting a semester and the option show time allocations for semester. The instrument science teams are granted guaranteed observing time in compensation for their investments. The coordinates and observing modes selected for these programs are for the exclusive use of these teams on GTC for the duration of their program. Therefore PIs wishing to apply for time on GTC are kindly requested to avoid combinations of reserved targets and observing modes. Details of the targets and observing modes may be found on the following web pages for OSIRIS, MEGARA, EMIR, Canaricam, HiPERCAM and HORuS, respectively. Some weeks before the start of the observing semester the Principal Investigator (PI) will be asked to complete the second phase of the preparation for the observations. This Phase-2 process aims to define the individual steps of the observing program in sufficient detail for the observations to be carried out by observatory staff astronomers, and to automate the observing process. Details such as instrument setup, target coordinates, and exposure times are fixed in this part of the process. At the end of this phase the full observing proposal will be described in a coherent and structured fashion, broken down into Observing Blocks (OBs), very similar to what is customary at other large telescopes. This important part of the observing preparation is carried out through a Phase-2 web interface. PIs will receive instructions on how to enter this process, well ahead of the observations. Moreover, a GTC staff astronomer will be associated with each scheduled observing proposal and may be called upon to assist the PI and her/his team in planning the observations. In the case of queue-scheduled observations the final definition of the observations must match the observing time and observing conditions granted by the time allocation committee. The total observing time specified in the Observing Blocks includes all the typical observing overheads. Standard calibrations taken by observatory personnel during the day or (preferably) during twilight (e.g. bias frames, twilight flat fields, spectral lamp exposures, and photometric or spectro-photometric standards) will be shared between users and not be accounted to the science projects (as explained in the previous section, OSIRIS tunable filter observations are an exception to this). However, any additional calibrations that the PI may want to obtain (e.g. nightly wavelength calibrations, specific calibration stars) must be described and where necessary defined as observing blocks and will account towards the total available observing time. Observing blocks are treated like atoms of an observing program and are normally not split in time. Long observing blocks are more difficult to schedule and more sensitive to unstable observing conditions (both atmospheric and technical). The observatory only guarantees the required observing conditions for observing blocks up to one hour and recommends using this duration as the maximum total length of any observing blocks. In the case of classically-scheduled observations the observations will also have to be defined through the normal Phase-2 definition process, preferably well in advance. The Observing Blocks will allow automation of the observations and the data handling, facilitate error checking, and will make the observing process more efficient. Clearly the selection of objects and observing modes must always correspond to the observing program as agreed by the time allocation committee. For observations that are scheduled as part of the observing queue the observatory aims to execute the observation when the sky conditions are at least as good as the conditions requested in the proposal and approved by the time allocation committee. For an overview of the sky conditions at the Roque de los Muchachos Observatory we refer the reader to the IAC site testing webpage and to this brochure, that, although now somewhat out of date, contains a summary of the general characteristics of the site. Note that to assess the seeing or image quality conditions we use the FWHM of point sources in the actual science images. These measurements of seeing cannot simply be equated to standard seeing measurements such as those delivered by a differential image motion monitor or to data that is normally used in statistical studies. Dependencies on wavelength, airmass and telescope aperture play a significant role. For instance, the actual seeing becomes worse as airmass increases or when observing at shorter wavelengths, and hence the chance of meeting a specific seeing requirement diminishes. PIs should take this into account when setting the seeing limit in their observing proposal. Extinction measurements are not always available in real time and hence the assessment of the cloud cover and dust extinction during the night may be imprecise. Observatory personnel will do their best to assess the transparency of the sky based on their experience. This may affect observations that require photometric sky conditions. The definition of observations in terms of Observing Blocks must take into account the unavoidable observing overheads. As a guideline, in the case of OSIRIS currently the main overheads are for target acquisition, 10 minutes in both imaging and spectroscopy mode (not including the time for acquisition and throughslit images), instrument preparation (30 seconds), and CCD readout (21 seconds in the standard observing mode). In case of the use of the tunable filter an additional 10 minutes is accounted for wavelength calibration, and, as explained above, night-time calibration observations must be specified as part of the program. For MEGARA, 10 min are assumed for target acquisition in IFU mode, while 15 min are considered for Multi Object Spectroscopy mode. For HiPERCAM and HORuS, the same overheads than OSIRIS/MEGARA (10 minutes per observing block) will be considered for configuring the instrument. In the case of CanariCam, in addition to the overheads for target acquisition and instrument and telescope setup, which are 10 minutes in the case of imaging and spectroscopy, there are also overheads associated to the chopping and nodding technique. Such overheads are obtained by multiplying by a factor of 3.1 or 3.7 the on-source time, in the case of imaging and spectroscopy, respectively (the same for normal or polarimetric modes). Additionally, an extra overhead of 20 minutes should be taken into account for every standard star observation in imaging mode, 25 minutes for a standard in polarimetry, and 30 minutes for a standard in spectroscopy and spectropolarimetry mode (overheads assigned to each standard star in all modes are rough numbers assuming 1 minute on-source time in the acquisition and/or spectra, which correspond to relatively bright targets and/or standards. If targets and/or standards are weak and longer than 1 minute on-source acquisitions and/or spectra are required, then calculations should be done more accurately using the overhead information in the Phase-2 manual). Finally, users should bear in mind that due to the limitation on the OB length in queue mode, shall a continuous observation be too long (longer than 1 hour), such observation must be split into as many OBs as necessary, each OB having its own acquisition overhead and possibly additional standard star observation overhead, since each OB might have to be observed on a different night. In the case of EMIR, an observation in imaging mode a total overhead of 10 minutes per observing block should be accounted for, while for longslit/multi-object spectroscopy this total overhead increases to about 20 minutes, to account for the CSU configuration and acquisition process, except in the case of telluric standard observations where CSU re-configuration is not necessary and only 10 min of overheads are accounted for. In addition to the overheads for target acquisition and instrument/telescope setup, there are also overheads associated to the observing technique. For typical science exposures, open-shutter efficiency for EMIR is about 70% in imaging and 90% in spectroscopy (including dithering, readout overheads, etc.). To optimize the telescope time for a predefined on-source integration time, applicants should make use of the EMIR efficiency calculator available here. Users should bear in mind that due to the limitation on the OB length in queue mode, shall a continuous observation be too long (longer than 1 hour), such observation must be split into as many OBs as necessary, each OB having its own acquisition overhead and possibly additional standard star observation overhead, since each OB might have to be observed on a different night. As a general rule, needless to say, it is extremely important not to underestimate your overheads during proposal preparation, otherwise you may end up in a situation where integration time has to be sacrificed in your science targets because the granted time is not sufficient to complete the requested observations. GTC accepts Target-of-Opportunity requests. These requests first have to be agreed and granted time by the Time Allocation Committee (TAC) before they can be considered for execution. The TAC may place certain constraints on their execution. 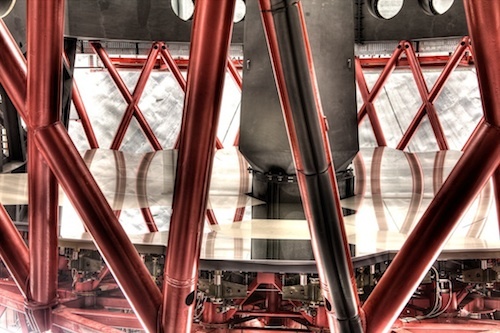 GTC´s procedure for triggering Target-of-Opportunity observations can be found here. 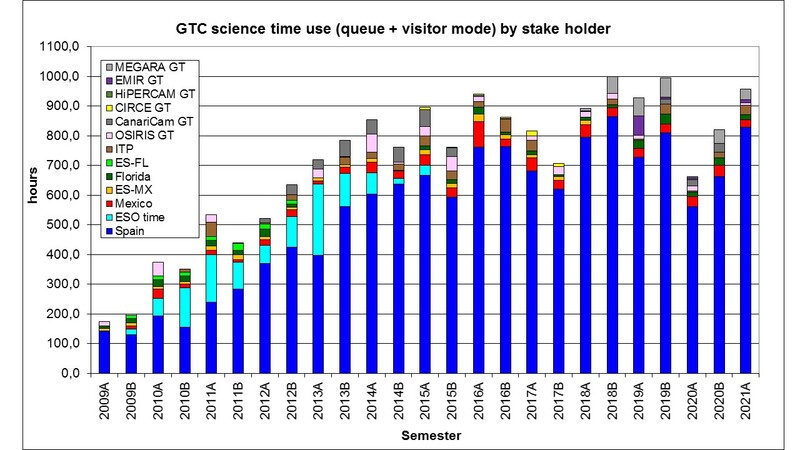 GTC is mainly scheduled following a dynamic queue of observing proposals. This means that the night-to-night observing plan is dynamic and responds not only to the scientific priority of the proposals, but also to the prevailing weather conditions. In this way the observatory aims to maximize the number of programs that can be completed according to the required sky conditions (seeing, moon phase, cloud cover, and precipitable water vapor), giving highest priority to the proposals that are most highly valued by the time allocation committees. This implies, however, that normally there is no guarantee that an observation will be carried out on a certain night, let alone on a given moment, as the detailed schedule depends on several variable. If the exact scheduling of a program is critical to its success, our advice is to request classical visitor mode since these programs are scheduled on specific nights and are executed under direct supervision of the PI . Apart from the scientific programs, some nights are devoted to non-scientific activities such as the commissioning of instruments, maintenance activities, etc. GTC´s observing calendar can be found here. Target-of-opportunity override requests only take priority over programs of lower scientific ranking. In case of a direct conflict between two target-of-opportunity requests, GTC staff will strictly follow the well stablished TAC policy. A program scheduled in visitor mode always takes priority, but can be overridden by a target-of-opportunity of higher scientific ranking. Other conflicts are resolved first and foremost according to their scientific ranking, whereby the guaranteed time proposals for instrument builders are always considered of highest priority, followed by GTC Large Programmes and TACs regular programmes. However, in order to obtain the best possible use of the telescope time for all parties, aspect such as urgency, sky conditions, number of opportunities, and technical aspects are taken into account, which may include consultation with the PIs. Once the observations have been obtained and are considered to be of the correct quality, the PI will be informed about how to obtain the scientific data files from the FTP server. The data will remain available on the FTP server for a period of at least 50 days. All observations are also copied to the GTC Public Science Archive, hosted at the Center for Astrobiology in Madrid (http://gtc.sdc.cab.inta-csic.es/gtc), which can also be used to avoid duplications when preparing a proposal. The PI enjoys a one-year proprietary period for her/his data, after which the data will be made publicly available. PIs are also encouraged to contact archive staff at CAB to submit their reduced data once they have been published. GRANTECAN aims to have the data distributed to the PI as quickly as possible after the data have been obtained, but given the current resource limitations this may take several working days. The PIs are actively informed when their data are available on the GTC FTP server. Moreover, in the Phase-2 tool each PI can see whether her/his observing blocks have been prepared for distribution. In distributing the data priority is given to Target-of-Opportunity datasets. To assist users of the GTC in preparing their programs and observations we point people first of all to the instrument pages that can be found on this web site. Another helping hand is provided in this observer's toolbox page where links, tools, and useful bits of information can be found. GRANTECAN welcomes suggestions and comments on your observing experience with GTC. Your feedback will help us to improve our service. If you have received observing time on GTC you can submit your comments through our feedback form at http://gtc-phase2.gtc.iac.es/science/feedback/feedback.php. 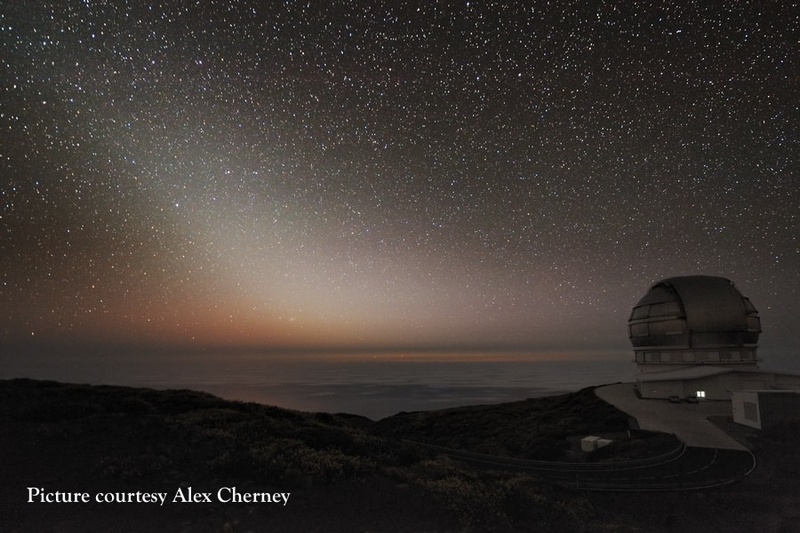 "Based on observations made with the Gran Telescopio Canarias (GTC), instaled in the Spanish Observatorio del Roque de los Muchachos of the Instituto de Astrofísica de Canarias, in the island of La Palma." "This work is (partly) based on data obtained with MEGARA/MIRADAS instrument, funded by European Regional Development Funds (ERDF), trough Programa Operativo Canarias FEDER 2014-2020." "This work is (partly) based on data obtained with the SHARDS filter set, purchased by Universidad Complutense de Madrid (UCM). SHARDS was funded by the Spanish Government through grant AYA2012-31277." "Development of CIRCE was supported by the University of Florida and the National Science Foundation (grant AST-0352664), in collaboration with IUCAA"
and will include a citation to the CIRCE reference publication: Garner et al. (2014), Proc. of SPIE Vol. 9147, 4. GRANTECAN would appreciate receiving preprint or references to publications that are based on data obtained with GTC.